The support provided by the State of Ohio, Lorain County, and the City of North Ridgeville, was a key factor in Riddell’s decision to reinvest in Northeast Ohio. 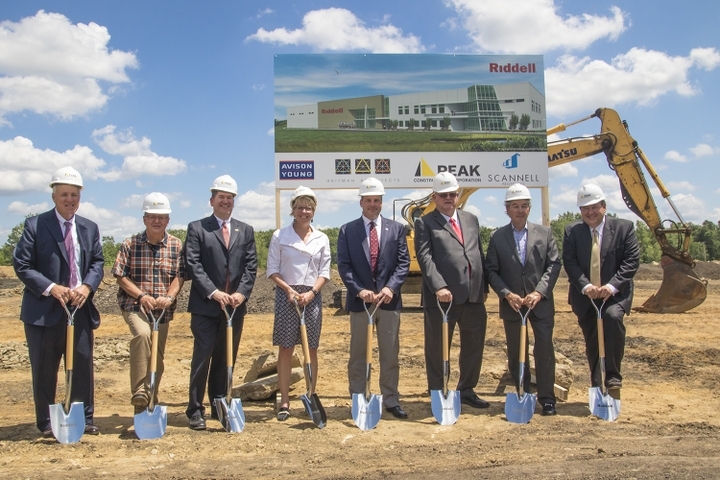 Riddell selected the North Ridgeville site based on several criteria including the need for more space to accommodate the growth of the company’s business and proximity to its current operations in Elyria, Ohio given the area’s strong employee base. North Ridgeville will be the company’s largest single location and provides operational efficiencies to better service Riddell’s customers. Riddell’s new 347,205 square-foot facility will be located on 30 acres of property adjacent to the Ohio Turnpike in North Ridgeville. The construction will require 12,500 cubic yards of concrete, which would be enough to fill about 400,000 football helmets. The development will use 1,000 tons of steel for the building support structure and when lined up lengthwise equals 65,000 linear feet or 216 football fields end to end. The new building will be temperature controlled to accommodate changes in the weather and will feature a fitness center, larger break and training rooms, additional storage and shipping/receiving access, and ample parking. Riddell will transition the activities of its current plant to North Ridgeville beginning in early 2017, with a planned exit from Elyria by the end of next year. Riddell’s collectible business and distribution, which is currently based in Rantoul, Illinois, will move to North Ridgeville by the summer of 2017. The groundbreaking follows months of planning and collaboration between many organizations, local and state officials, and the Riddell team. Riddell is appreciative of the support provided by several public entities including JobsOhio, the Lorain County Port Authority, the Ohio Department of Transportation, and the City of North Ridgeville. The company’s key partners on the project include Avison Young Project Management (real estate consultant and construction manager),Incentis Group (public incentives consultant), Scannell Properties (developer), Peak Construction Corporation (design builder), Heitman Architects (architect), and R.E. Warner & Associates, Inc. (engineers).